Satos (pronounced with a short A) are a type of dog rather than a breed. The name is Puerto Rican slang for “street dog,” but they are also known as Puerto Rican Found Dogs in the U.S. 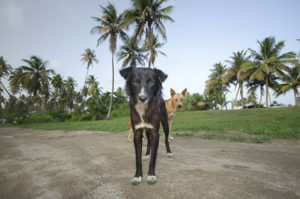 They are the homeless dogs, or urban free-ranging dogs, that live in Puerto Rican cities. They are different from regular strays in that they have limited territory, and many have consistent contact with humans. Satos have existed as long as Puerto Rico has. These are the ancestors of working and hunting dogs that were brought to the island long ago. Today, Satos are rescued mostly by shelters in southern U.S. states because of their proximity to Puerto Rico, but are then often sent to Northeast rescues because of the overcrowding in Southern shelters. Satos are now beginning to gain popularity as family pets throughout the U.S.
Due to their diverse ancestry, Satos vary in looks quite a bit but often share some common characteristics. They tend to be small to medium-sized, with slightly folded ears and a thick, short coat. What is surprising is that these neglected, sometimes abused dogs make very good family pets. Homeless Satos encounter many health issues including rabies, parasites, and mange. Once these problems are tended to, they tend to be healthy dogs. All Satos coming from Hearts and Tails partner organizations have had temperament tests and an extensive before the dogs are made available for adoption.